This book has been out for a few years but I just bought it recently. Although I have been machine quilting for MANY years (almost 20!) I still collect books that give me inspiration for quilting my quilt. I am pleased that this part of the 'make a quilt' process has had more attention in the last few years and it is easier to see how quilts are quilted in these type of books. I don't have to squint at pictures of quilts in other books to see how they were quilted! I HATE that statement....'Quilt as desired.' How do you know WHAT you desire? How do you know what you can DO? That is why I include information about quilting ideas in every pattern I publish. I often try to suggest a couple of options so the person who makes the quilt can be successful when they finish the quilt, just as my instructions are detailed so they can make the quilt top. 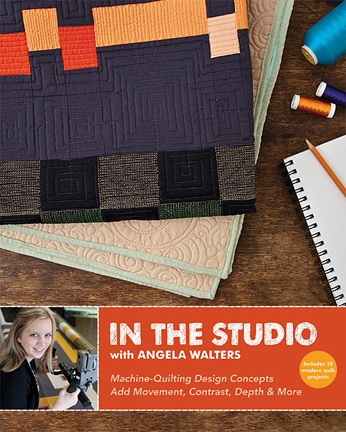 Angela's book includes 10 modern quilt projects but it is the QUILTING ideas that I find most intriguing. You don't need a longarm quilting machine to use the techniques in the book. She talks about how the quilting can add movement, depth, dimension, focus and contrast in your quilt. These are many of the characteristics that we have in mind when we choose fabrics for our quilts. To me, that says that the quilting is an INTEGRAL part of the quilt. Therefore it should be as exciting to us as making the QUILT TOP! Is it exciting to you.....or does it scare you? Here's my take on that. I'm sure you were scared when you made your first quilt top. Did you choose the right fabric, are your seams accurate, did I mis-cut something? But you persevered and learned new things with every project you made. It is the SAME with machine quilting. You WILL start out scared, you WILL have doubts but you can only GET BETTER if you do more! And this book (and many others) will give you ideas for lots of quilt to come! I particularly like seeing how Angela plans her quilting by sketching her quilting plan in a sketchbook. This technique allows you to see what the quilting will look like, and more importantly, HOW you will need to stitch it. It gives you a bit of practice if you remember to sketch without lifting your pencil! I highly recommend this book if you are looking for Quilting Inspiration! This is a STASH book and it is available for purchase HERE.